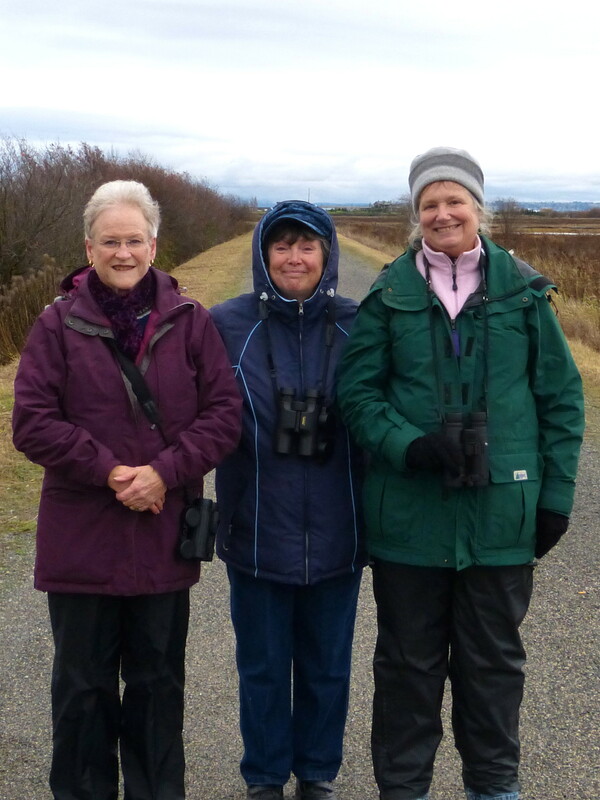 Three stalwart birders, Lorna, Marion S. and Marti, left Petra’s around 9:20 a.m. Roger and Kay were there with notes from their mothers excusing them from participating on account of inclement weather, or domestic duties, or better things to do. We three proceeded to the 72nd St. dike where we saw or heard numbers of the regular birds: Robins, Song Sparrows, Golden-crowned Sparrows, House Finches, Marsh Wrens, Flickers, and Great Blue Herons. Many Short-eared Owls hunted and rested on both sides of the dike, as did Northern Harriers. We were treated to a juvenile Northern Shrike and an aerial display by a banded juvenile Peregrine Falcon which also seemed to spar with another one at one point. On the return journey to the car, two Peregrines, one smaller than the other, were sitting side by side up high on a wire. 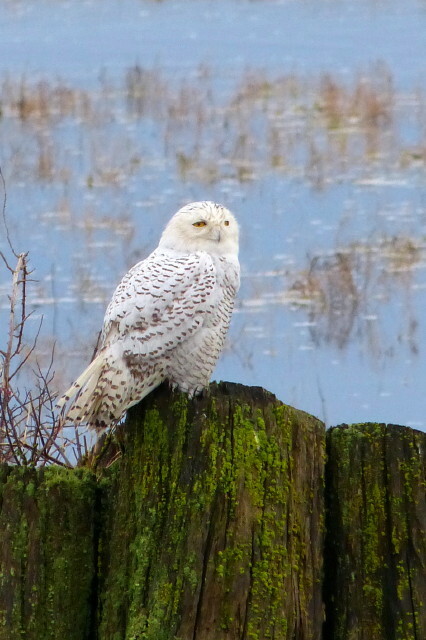 Continuing along the dike, we counted 15 Snowy Owls, and were pleased to see that. It was a good hike toward 64th to see them. While observing the owls, we also saw a small flock of Yellow-rumped Warblers, and one Orange-crowned Warbler. 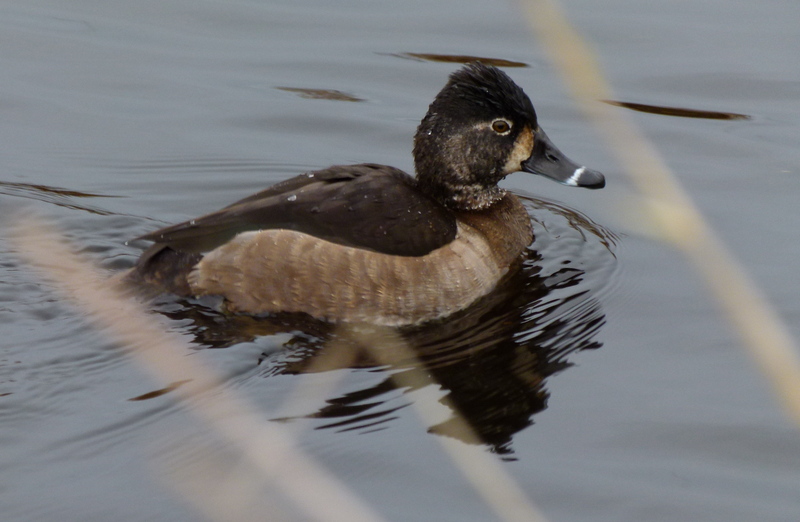 There were Wigeons and a single female Hooded Merganser in the pond by the moat house. There were many ducks in the bay, clouds of shore-birds, and the occasional hawk for which we would loved to have had a scope. A lone female Northern Shoveler fed in a close tidal pool. Red-tailed Hawks, Eagles, Trumpeter Swans, and Gulls hung out along the road at various points. Although it was dry for most of the morning, once we got underway, it did start to rain just before we turned around to head back to the car, so we had a lively hike in the gentle rain, which by the way, did not deter the hunters. The good news is that the road is being resurfaced — NO MORE POTHOLES, until they grow back. Being sensitive to being cold and wet, Mike and Roger decided to delay our departure until the weather improved (my wife forged the two letters from our mothers). 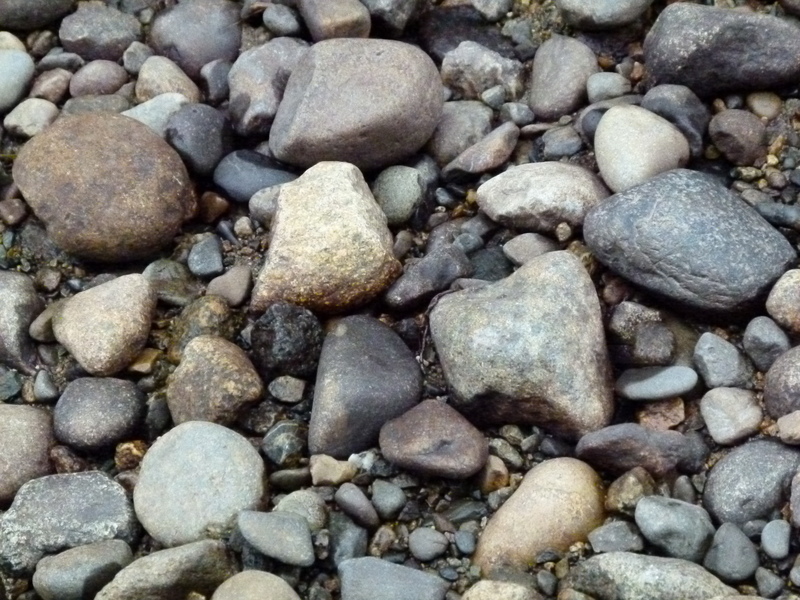 Unfortunately, we could find no one to take a picture of the “stalwart duo”, so I’m substituting this incredible photo of a rock pattern where Mike discerned an amazing likeness of Winston Churchill. Not wanting to duplicate the route of the first group we drove to the ferry jetty where a 15 foot tide left no room for the usual shorebirds and others usually lining the shore. A few Double-crested Cormorants were on an exposed reef and some Common Loons were on the water, but it was quite rough. Moving along through the TFN lands the Kingfisher Creek was almost overflowing due to the rains and the tidal backup. Some Northern Harriers were seen on the marsh, and a few Northern Flickers flew overhead. It wasn’t until we reached “Sparrow Corner” that things started to pick up with White and Golden-crowned, Song and Fox Sparrows. We had a fleeting glimpse of two Western Meadowlarks in a field, and about 90 Snow Geese. We scanned a field with 35 swans, but they were all Trumpeters and two Dowitchers. On the bridge at Canoe Pass we saw the usual Green-winged Teal, American Wigeon, Pintail, Mallards, etc. A pair of Peregrine Falcons took a swipe at each other in passing, and we had a good look at a Rough-legged Hawk hovering. A side trip down Tamboline Road produced only a Red-tailed Hawk in a tree and a brief discussion with Bill Husband who said he hadn’t seen any Barn Owls in his barn. At this point, we were running out of time and did a quick circle through Reifel where we met Al Grass waiting for Jude to finish a meeting in Alaksen. He clued us in to a few birds, and we did see the first Ring-necked Ducks of the season as well as some Hooded Mergansers. Also, our best wishes to Hans for a quick recovery from his back surgery… we miss you out here in the cold and wet! Next week, again, we will “go local” as there is so much activity with the raptors in the area. Meet at Petra’s between 7:30 and 8:00am for an 8:00am departure. Roger (filling in for Ken and Tom). This entry was posted in *DNCB, 72 Street, Bald Eagle, Northern Harrier, Peregrine Falcon, Red-tailed Hawk, Reifel, Rough-legged Hawk, Short-eared Owl. Bookmark the permalink.